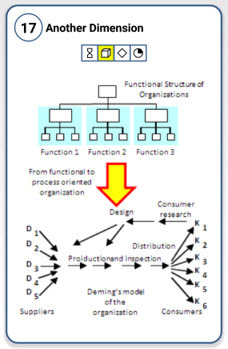 Transformation of functional structure of organization to process oriented organization. 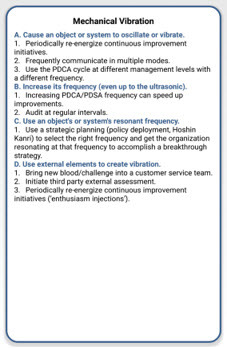 The inventive principle ‘Mechanical Vibration’ implies a way of improving system/process performance by increasing the PDCA loop frequency. By varying the frequency, amount and content of information in a loop, it is possible to create different effects. 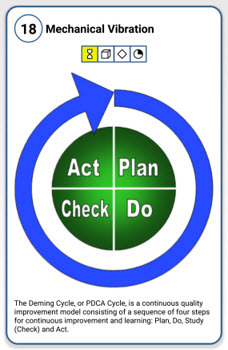 The inventive principle ‘Periodic Action’ implies the use of periodic actions instead of continuous vibration. 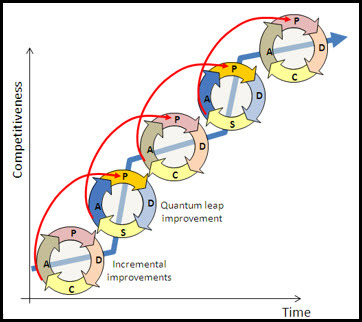 In quality management use an alternate PDCA cycle for incremental improvements and PDSA cycle for quantum leap improvements. 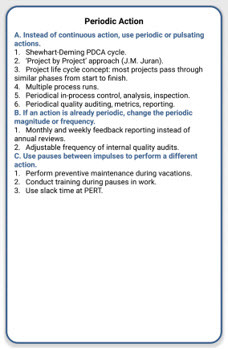 The inventive principle ‘Continuity of Useful Action’ implies continuing the useful function or eliminating idle time or eliminating or shortening the duration of harmful functions. Skipping or rushing through involves conducting a hazardous or costly operation at a high speed in order to minimize harmful effects. 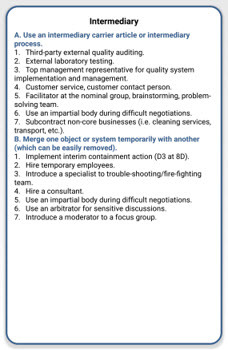 The example in the picture shows the procedure of conflict-solving. 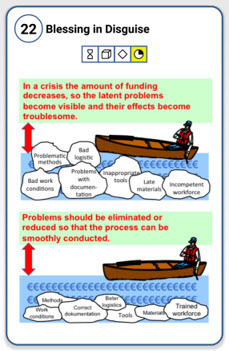 Any conflict that causes delay (a harmful function) will cause loss of revenue (an effect). For that reason conflicts should be resolved as quickly as possible. Blessing in Disguise means converting a harmful function/effect into a useful function/effect. 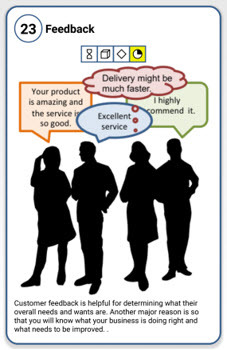 We can run a process at maximum process setting. 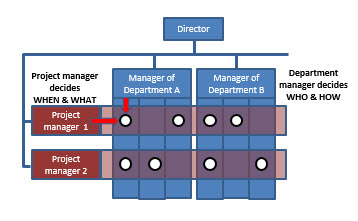 Discover the created defects from this possible setting. Then we can address these possible defects. 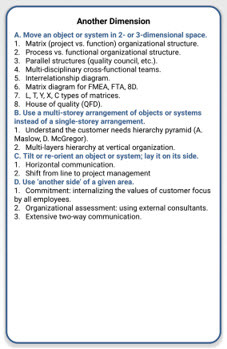 For example, we can create documentation that shows these defects. 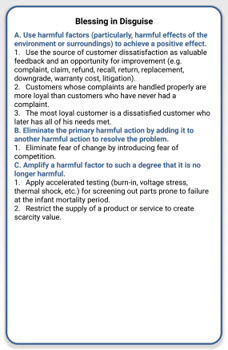 Another example is a customer corrective action. 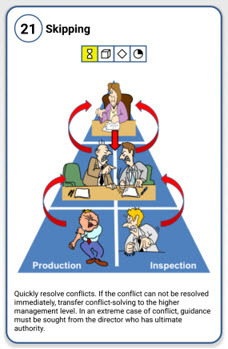 During this process you determine the root cause of the corrective action and then correct the root cause. 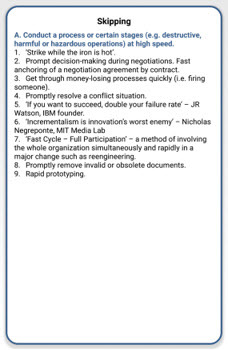 Then you take these actions and apply them to other products to prevent possible issues. 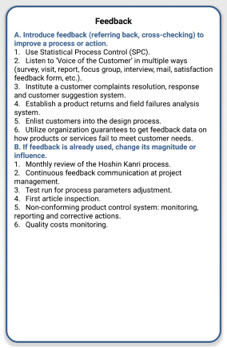 Feedback information means process information sent to the process owner about the process results. 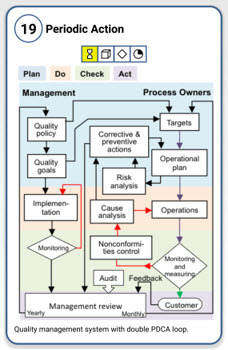 This lets the process owner adjust its current and future operations in order to achieve the desired objective. 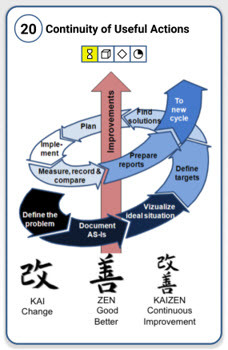 Statistical Process Control (SPC): measurements are used to decide when to modify a process. 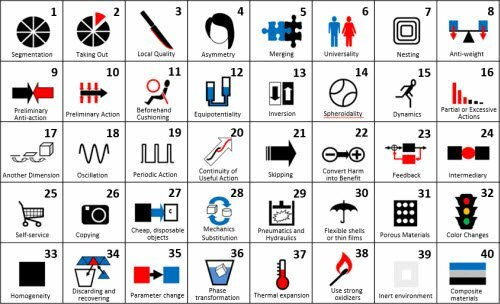 The inventive principle ‘Intermediary’ refers to the use of an intermediate carrier between two objects, systems or persons. 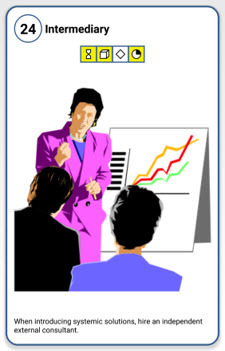 A consultant provides unbiased professional or expert advice in a particular area such as quality management, security, safety, environment, etc. 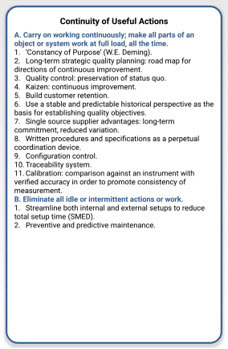 The QMS Auditor is a person appointed and authorized to examine documents and records, processes and other elements of a quality system to determine their conformity with requirements.